Can multiple spells with 'Flash' go on the stack in response to an instant? Do attack triggered abilities trigger before aetherize returns creatures to hand? Return all attacking creatures to their owner's hands. How do AEtherize , AEtherspouts and Polymorphist's Jest perform based on your expirience? I've always been reluctant in putting them because on paper they look situational and/or limited to one opponent, prefering card such as Evacuation and Engulf the Shore that get (almost) every creature at any point. Do you find that including them to preserve your side of the board is worth the "reststrictions"? 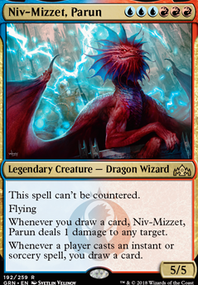 Estrid's Invocation seemed kind of anemic given how few legal targets it had, replaced with Copy Enchantment to hopefully have more good targets. Replaced AEtherspouts with AEtherize for slightly more Mana efficiency. 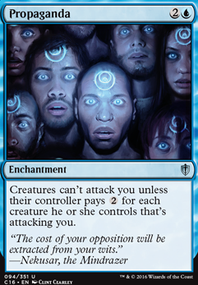 Replaced It That Betrays with Tidespout Tyrant , without other ways to make opponents sacrifice permanents, It That Betrays just functions as a 12/12 beater. Replaced Body Double with Vesuvan Doppelganger . My playgroup Has a LOT of exile effects and graveyard hate, so I couldn't find a consistent source of targets for Body Double. The answers to your questions vary more based on your deck than they do based on your meta. If you are playing a control deck, 8ish counterspells is usually sufficient (providing you've got plenty of card draw to make sure they show it). 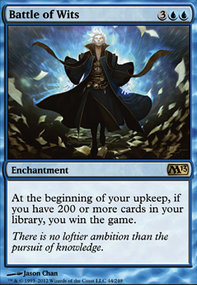 I usually go for some selection of Disdainful Stroke , Arcane Denial , Counterspell , Negate , Essence Scatter , Dissolve , Sinister Sabotage , Swan Song , Commit / Memory and if you can afford them Pact of Negation , Mystic Confluence , Cryptic Command and Mana Drain . Important to remember that Cryptic is not as good in commander as it is in 60-card formats, and Force of Will is mediocre at best. If you are NOT playing control, don't play counters. Board wipes, if you are playing a heavy creature based aggressive deck, should be zero. If you are playing control, three-four. If you're playing superfriends, 8-9. At least two of Wrath of God , Day of Judgment , Supreme Verdict and Damnation should always be the first ones you put in, followed by Merciless Eviction , Blasphemous Act , and Austere Command then some selection of Cyclonic Rift , Evacuation , AEtherize , Settle the Wreckage , Fumigate , Kaya's Wrath , Chain Reaction , Akroma's Vengeance , Terminus , In Garruk's Wake , Necromantic Selection , All Is Dust and Kindred Dominance . Prioritize your picks to 1) be cheap so you aren't restricted from casting them and 2) be flexible - Merciless Eviction and Austere Command should be high pirority picks, and things that bounce/tuck/sacrifice are good for indestructibility. As for spot removal... play little to none. Unless your deck focuses on it, it's fairly weak. 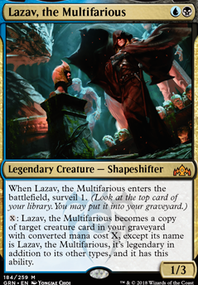 I'd run things like Hero's Downfall / Vraska's Contempt / Beast Within / Swords to Plowshares / Path to Exile because they are cheap, flexible, and can deal with hard-to-answer permanents, but I wouldn't typically run more than two-three in a deck. The exception, of course, is right here: Shameless self promotion. Remember that you're playing in multiplayer pods. If you spend one card to answer an opponent's one card, you're down by the two cards your other two opponents didn't have to spend. That makes both spot removal and counterspells much worse than usual. Board wipes are by far preferable to both options. another card to consider is Sleep over AEtherize ... again it kinda depends on the matchup tho... going against Aggro/Tokens AEtherize is tough to beat but against those hiding behind walls/blockers Sleep can turn into pretty much 2 free Alpha strikes which is kinda like the blue version of Overrun /you win GG. anytime and good luck happy brewing! thom-le I will go take a look at your deck and let you know how the button works. I'm so glad to hear that you have tested my deck out. I think it runs very well and I appreciate the suggestions to enhance some of the cards already in the deck. I think AEtherize and Flood of Recollection are great cards and I have thought about adding them in the past. I'm to that point where it is hard to cut cards. But I will say that the one card I was thinking about cutting was Land Equilibrium. Not that it doesn't help but its tough to spend turn 4 casting that card. It really does "get" the ramp decks which is great but it can also be a card that just does nothing. Settle the Wreckage is also great, but I hate ramping my opponents. Having Land Equilibrium out would be necessary for me to want to cast that. I think there is enough bounce in the deck that it isn't necessary but that might just be my meta. It is still a great card and would make sense to play over other cards if you own it. 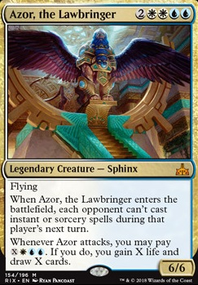 Balance effects draws so much hate in my area that I stay away from those cards but they do work with this deck seeing as how you are usually not ramping at all. I also love the idea of Shimmer but I'm trying to keep my instant and sorcery count high so I tend to avoid enchantments. See... Metallurgic Summonings .